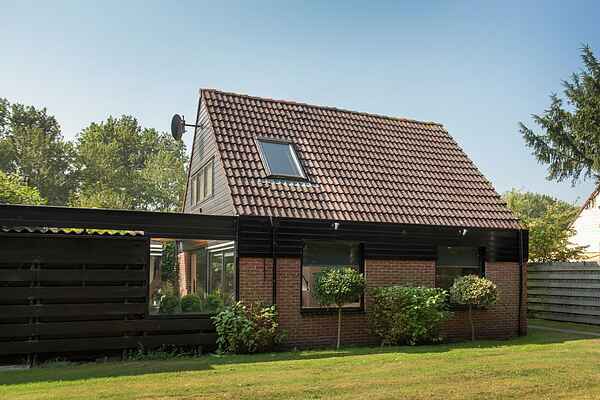 This holiday home has been completely renovated and is on the edge of a spacious, green park in Noordwijkerhout. The house is situated along the woods and within walking distance, you will find a swimming lake with a beach. The North Sea beach, the dunes and the sea are nearby. In your holiday home you can enjoy a lot of privacy and modern comforts. On the ground floor you first enter the cozy, bright living room with a comfortable seating area and a modern open kitchen with all the necessary appliances. The bathroom is stylishly furnished and equipped with a delightful rain shower. Via the large sliding door you have access to the sunny, enclosed garden with terrace and barbecue. The area is ideal for hiking and cycling. Following the path behind the house, you can walk to the recreational lake, where you find a swimming beach. You can also eat and drink here and you can even rent a boat. The park itself has a lot of playgrounds for children, a small supermarket, a restaurant, tennis courts and bicycle rental. The beach and the sea are a few minutes away and towns and nearby attractions, such as the Keukenhof and Space Expo are worthwhile to visit and easily accessible. Extra information: It is not possible to park nearby or next to the bungalow. There is a central parking area where you can leave your car. The caretaker will come to meet you, and she will help you carry your luggage to the property, among other things.